In organizations, leaders must get tasks done through their team members. On the surface, this appears to be an easy thing to do, as leaders have formal authority over their team members (by virtue of organizational hierarchy) and so, can simply issue orders to get things done. However, a survey of team leaders across companies working in varied business environments and at different levels in the hierarchy show that most of them harbor frustrated feelings like “in spite of numerous reminders, quite often things don’t happen on time”. Over the years many management tools and tactics have been applied to improve productivity and speed of execution by teams. Many of these attempts improve productivity to a certain extent; however it still falls short of desired levels in terms of reliability, quality and magnitude of output. Some leaders try to circumvent these problems by having experts define “standard times” for various tasks and holding people accountable to complete tasks within those standard times. This tardiness of team members is mostly blamed on poor attitude and lack of motivation. Therefore it is an accepted practice in most companies to try and induce the right attitude / motivation among people by meting out rewards and punishments based on deviation between “actual” v/s “planned” completion dates. While popular, both experience and research indicates that this method is severely limited and can on occasion be counterproductive. •	Problems are revealed to senior management at the last moment. When the problems are investigated in depth, it is found that they have existed for several days but were brought to the attention of senior management very late, by which time there is not enough time left to take countermeasures to prevent delays. This creates a feeling with the management that people try to “hide” problems and reveal them only when it is no longer possible to hide it. To counter this tendency, solace is often sought in software tools. The belief is that these tools give managers real time visibility of status of tasks, which will ensure that appropriate corrective actions are taken on time. Others increase frequency and depth of review meetings. Yet, in spite of using all these techniques and tools, tasks (and projects) continue to finish late!! Why do these tactics not work? These commonly used techniques may give some marginal results. However, it must be acknowledged that there are certain inherent flaws in these techniques that render them ineffective. 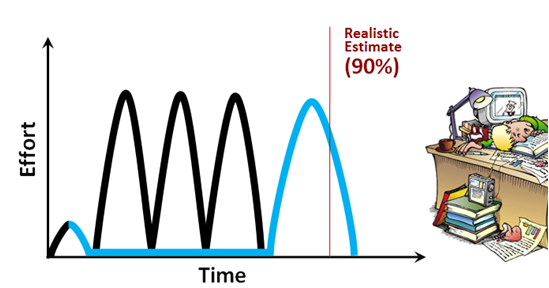 Most tasks involve some element of uncertainty due to which the exact time required to complete a particular task cannot be predicted accurately. This is independent of a person’s skill, knowledge, experience, learning curve, attitude, motivation etc. For example, the task of traveling from home to office in a car is repetitive, done almost daily. Over a period of few weeks at the most, any person will develop enough skill, knowledge and experience to do it well. Now, if you ask a person exactly how long he/she will take to do this task next time, they wouldn’t know precisely. They can only give a range– say 25 to 35 minutes – but not a precise number. This is a task where all typical reasons given for variability/delay in task execution such as – change of scope, rework, lack of skill/knowledge/experience, learning curve do not exist. Still, it is subject to external uncertainties like traffic conditions, repair/construction work in progress on the route, hold-up because of pedestrians crossing, signals etc. Most tasks that we do are subject to such uncertainties that are totally beyond our control – for e.g. dependencies on other people, events or other tasks. Trying to eliminate these uncertainties is futile. Thus, asking for a commitment date in such an environment of uncertainty puts people in a dilemma – should they commit to an aggressively short duration (assuming everything will go well) or should they pad up the estimate and commit a “safe date”? If there are rewards and punishments linked to adherence to committed dates, people will naturally be more inclined to commit only to well-padded dates. Then, in execution, the conviction that there is safety built into the committed deadlines further instigates behaviors that are counterproductive to the goal of fast execution. Since people are always busy with a series of tasks, most wait until the last day/hour/minute to start a task that was planned weeks before (Student’s syndrome). Or the work will expand to fill to the extra time allotted for its completion (Parkinson’s Law). Either way, work is unlikely to finish fast. When these behaviors are ingrained, neither software nor frequent reviews help because both these can be suitably gamed to protect individual interests of people (for example, most will use up the entire committed time so that in the next instance, the time estimate for the task will not be cut). So in spite of all the tactics and tools, managers are unable to ensure that work is done fast. This makes them erroneously conclude that the problem lies in “capability” or “attitude” of people – they are not sufficiently motivated, don’t take initiative, are not ready to work hard etc. As discussed earlier, the nature of tasks that we do in our typical workday have some elements of uncertainty which are beyond our control and cannot be removed. However, there are many other things that we do inadvertently during task execution which end up elongating the time to complete tasks significantly. These are completely in our control and eliminating these can bring about a dramatic reduction in lead time. For this, we have to understand what it means to do a task in the shortest possible time or “touch time”. We have already concluded that because of inherent uncertainties involved, the precise time required to a do a task cannot be predicted. In that case, how can we be sure that a task was done at the fastest speed possible? After all, there is no reference with which we can compare! This can be done by observing the conditions under which the task was performed. Looking back after having completed the task, it should be possible to claim (each and every time) that the task was done without any waiting times (at least those waiting times which are in our control). When this happens it can be said that the task was completed in touch time. But when a particular task has to wait for the resource to become free to work upon it, then the time needed for task completion elongates. •	Task started with partial information/inputs and now waiting to receive missing inputs. If these three types of waiting times are removed, we can claim to have completed the task in the shortest time possible. Everyone in a company (irrespective of function or hierarchy) has to make a list of all tasks pending with him/her. Then these tasks have to be put in descending order of priority. Work should start on the highest priority task. The picked up task should be worked on continuously till completion. Only then should the next priority task be picked up. The fastest way to complete a task in hand is to deploy maximum resources on it. So, maximum resources should be assigned to the top priority task. But if some resources are available, these can be assigned to the next priority task and so on till all resources are deployed. The tasks that are worked upon are called “active tasks”. All other tasks should be on a “wait list” and no work should happen on these. The number of active tasks is called WIP limit for that team. It represents the maximum number of tasks that can be active at any point in time. Only when one of the active tasks is over, will the highest priority task in wait list become active. Thus, tasks will flow with the principle of one out, one in. A task is considered complete only when it meets its “closure criteria”. This will be defined such that the task is complete in all respects, for the next entity in the chain to work on it. Nobody in the company (not even the CEO) should be able ask someone to stop an active task and take up something else instead. Full-kit is defined as all inputs required for finishing a task (not to just start it!!). In order to ensure that team members don’t have to wait to gather missing inputs, once they start work on a task, the team leader must gather the full-kit while the task is in “wait list” and make it available to the team. One of the roles of team leader will be to check full-kit availability for tasks in the wait list (checking should happen in order of priority). A wait-listed task can become active in order of priority, only when one of the active tasks is completed and full-kit for the wait-listed task is available. If full-kit is not available, that task cannot become active even if it is next in priority. Unforeseen obstacles might crop up during task execution which must be solved quickly to avoid increasing lead time. Doing a daily review helps in detecting these obstacles without loss of time. Daily review (called daily flow meeting – as it checks flow of tasks) should be done at a fixed time, fixed place and with fixed participants. Team leaders should conduct these daily flow meetings. Discussion in this meeting is about reviewing progress in last 24 hours and setting expectation of how much work will be done in next 24 hours with each team member. Evaluation of progress in last 24 hours gives a clue to whether there is any obstacle which could slow down work on the task. If these three rules are followed in letter and spirit, waiting time of tasks can be reduced or eliminated. Therefore, shifting to this method of task execution can cut lead times by at least 30% and more than double the output in almost all environments without adding resources and without consuming much bandwidth of senior management. Nice blog and too informative. The points presents in the blog is so impressive. Update more blog like this. Really appreciating for doing the blog like this. Thanks for sharing. Keep on updating more information. Eagerly waiting for you updates.